Delicious home cooked food with a wow factor vista means eating at the Bamburgh Castle Inn is a recipe for success. We’re open daily for morning coffee, lunch and dinner. 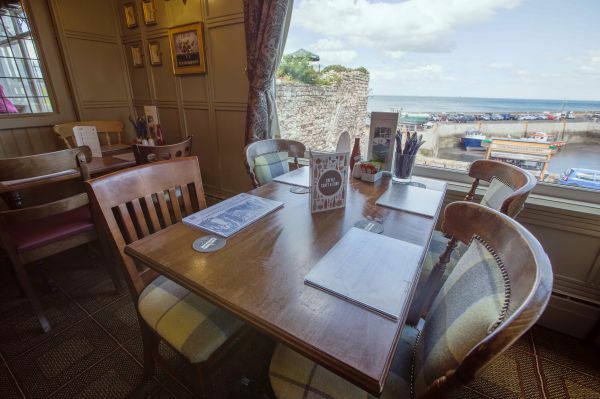 Our spacious but cosy dining areas include a restaurant, upstairs Sea View coffee lounge and outside eating and drinks tables.Our award winning chefs cater for everyone’s tastes with quality food cooked to order. Choose from our Light Bites menu or tuck into a great selection of main courses in our Core menu. On Sundays try our mouth watering Carvery where you’ll enjoy succulent and generous portions of hand carved British beef, lamb, pork, ham and poultry. Look out for our chef’s Daily Specials using the best local and seasonal ingredients including fresh fish and shellfish landed on the quayside close by. To compliment your meal we offer our own house label wines in White, Red and Rosé and a carefully selected range of fine wines from around the world. Champagne is also available by the bottle. Climb the stairs for more spectacular views and maybe one of our delicious pastries or a slice of home baked cake in the Sea View coffee lounge. Children are most welcome in our dining areas and we provide a host of family food favourites to keep everyone happy. In keeping with our licensing regulations we ask that children vacate these areas by 9pm. To view our menu, please visit our website. The last time I visited in April 2015 I was underwhelmed. This time things were much better. We enjoyed an excellent steak and ale pie with a local ale: succulent beef and a rich gravey. This was classic comfort food, well executed at a good price. Add in excellent, friendly service and a great location with sea views, this was a very enjoyable visit. Also, nice to return somewhere and find it improved. Lovely meal with our dog sitting next to us! Initially wanted the lamb burger however none left on a Wednesday night?? We were very happy with our meal though, and our daughter loved her unicorn ice cream! Our dog was also very happy to lie under our table while we were eating.